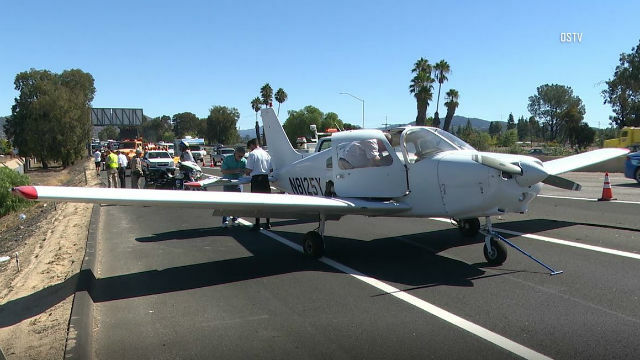 A light plane occupied by a flight instructor and a student pilot made a safe emergency landing Friday amid late-morning traffic on Interstate 8 in El Cajon. The two San Diego men were performing a descent in preparation for landing at Gillespie Field when the engine of the Piper PA-28-161 Cherokee lost power shortly before 11:30 a.m., according to the California Highway Patrol. Realizing that he and his 36-year-old student would not be able to reach the airport, the flying teacher — identified by San Diego State University as former baseball star Ryan Muno, 25, who graduated in 2015 — took the controls, diverted to the south and set the plane down on the north side of the freeway, near Second Street, CHP public affairs Officer Travis Garrow said. Cellphone video recorded by an occupant of a car traveling along the freeway showed the aircraft smoothly landing between several westbound vehicles. “There was no damage to the aircraft, motor vehicles or property and no injuries sustained as a result of the emergency landing,” Garrow said. After rolling to a stop, the errant single-engine plane blocked several lanes on the freeway. Caltrans personnel rushed to the scene and pushed it onto the nearby Mollison Avenue off-ramp, allowing traffic to get through the area with minimal disruption. The 39-year-old airplane is registered to Gillespie Field-based So Cal Leasing, according to Federal Aviation Administration records. The FAA and the National Transportation Safety Board were called in to investigate.